This recipe calls for a small amount of orange juice concentrate; the rest can be used to make juice. Pulse until mixture resembles large crumbs, about 12 long pulses. Pulse until dough comes together, adding 1 more tablespoon water if dough is too crumbly. Gather dough into a ball, wrap in plastic wrap, and refrigerate for 2 hours before rolling. Preheat oven to 350 degrees. Roll dough out on lightly floured counter to 1/4 inch thickness and cut with your favorite Ann Clark cookie cutters, then transfer cookies onto cookie sheets that have been lined with parchment paper or silicone liners. Bake 8 to 10 minutes, until lightly colored. Let cookies cool slightly on cookie sheets, then transfer to a wire rack to cool completely. 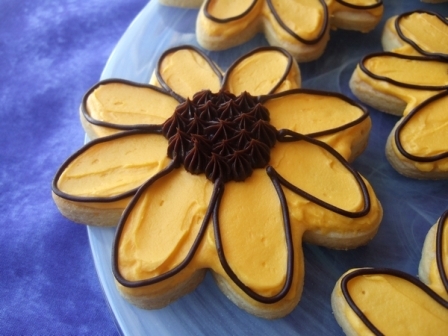 Frost with orange frosting and decorate with Ganache, if desired. With an electric mixer, beat together 1/2 cup (1 stick) softened unsalted butter, 1 pound confectioners' sugar, 3 to 4 tablespoons orange juice, and 1/2 teaspoon orange extract until smooth.